Christmas in the Marianas: Laolao Bay Lulu and Managaha Manny join the Parade of Floats! There are two active Pride Campaigns in the Commonwealth of the Northern Mariana Islands (CNMI): the Laolao Bay Pride Campaign and the Managaha Sanctuary Pride Campaign. Pride Campaigns employ social marketing strategies to change behaviors that are threatening our environment. The Laolao Bay campaign is focused on encouraging landowners in the Laolao Bay watershed to improve their soil management practices, while the Managaha campaign is concentrating on increasing compliance with marine protected area (MPA) rules and regulations. 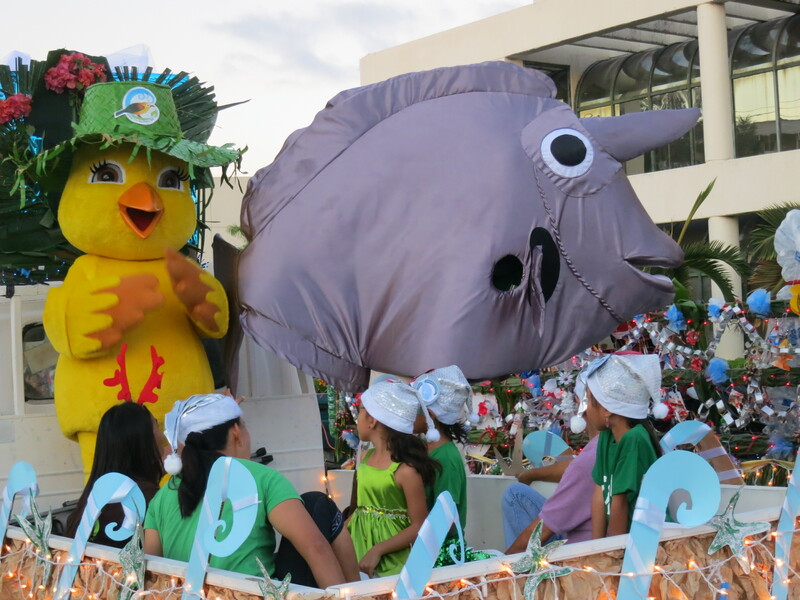 Mascots, Laolao Bay Lulu and Managaha Manny, partnered with the CNMI Girl Scouts in Saipan’s Parade of Floats, on December 21st, to celebrate the official opening of the Christmas season. Lulu is a canario, the golden white eye, a bird found only on Saipan and Aguigan (Goat Island). Manny is a tataga, the bluespine unicornfish, found across the Indo-Pacific. The float featured the two mascots together with the Girl Scouts who were dressed in green with Santa hats decorated with the campaign logos. 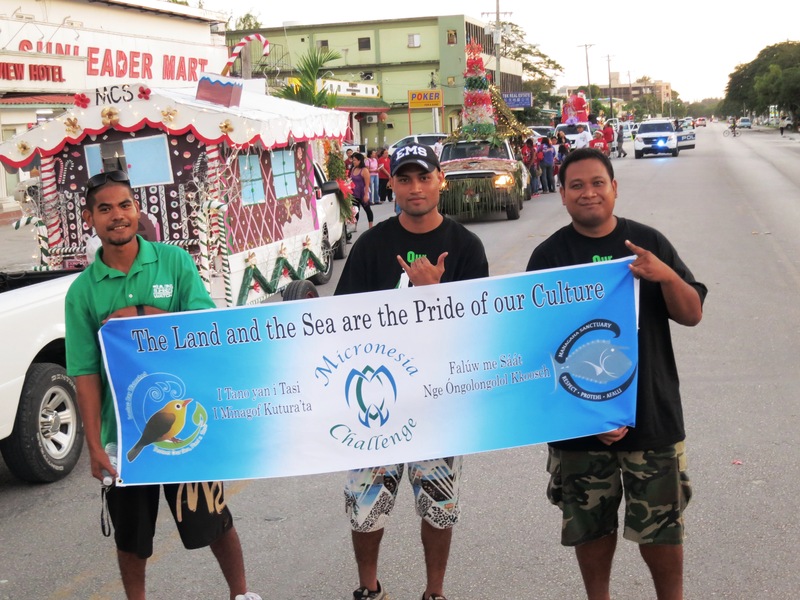 The Girl Scouts decorated the float keeping the CNMI Micronesia Challenge motto “the land and sea are the pride of our culture” in mind. Everyone loved Lulu and Manny, snapping photos they passed by. It was a great event and Lulu and Manny send their love, wishing everyone Feliz Navidad and Happy Holidays from Saipan! Here’s to an exciting 2014! Please like the CNMI Micronesia Challenge, the Laolao Bay Pride Campaign, and the Managaha Pride Campaign on Facebook to stay up to date! Happy Holidays from the AIC! American Samoa is currently experiencing a Crown of Thorns Starfish (COTS; alamea, Acanthaster planci) outbreak on their coral reefs. COTS are a type of starfish that prey upon coral tissue and can cause significant damage to reefs. 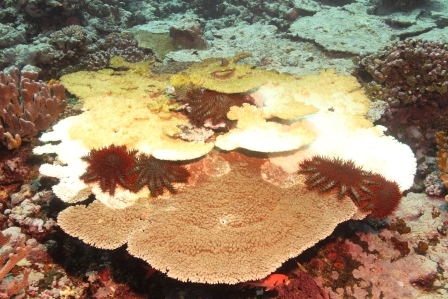 While normally rare, COTS occasionally have huge population spikes where millions of individuals suddenly appear on the reefs. The last COTS outbreak in American Samoa was in 1977 and despite the removal of 480,000 starfish, many more remained on the reef. 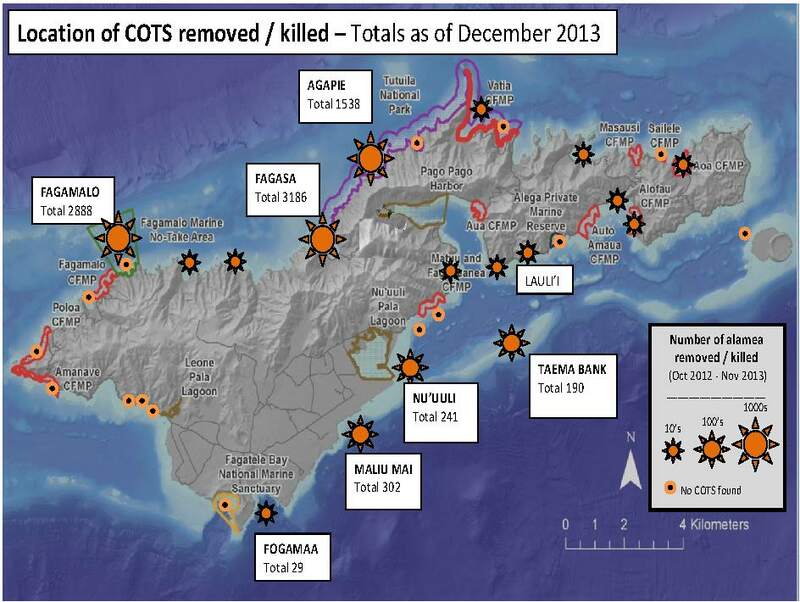 Consequently, over 80% of the Territory’s corals were estimated to have been killed. In response to the alarming number of COTS around Tutuila, the main island in American Samoa, a team of agencies have activated the Assessment and Rapid Reef Response (ARRR) Plan to survey and remove the COTS. By keeping track of the spreading population of COTS, response can be more effective and priority areas are kept protected. Agencies are also conducting outreach events in communities and schools and holding trainings with local fishermen to safely assist with removal efforts. Despite these efforts, more assistance will be needed over the next few years. Continued funding and qualified divers will be essential to supporting local efforts. To learn more about this COTS outbreak, please contact Kristine at Kristine.bucchianeri@doc.as. Also, visit the AIC web page on American Samoa to learn more about their other coral reef-related activities. What Does 100% Coral Cover Look Like? Community-based management is a key component in conservation in the Marshall Islands. An action plan and field guide was developed called, “Reimaanlok,” which in Marshallese means “looking forward.” As part of the management plan, a marine resource survey was necessary to establish potential places for conservation areas and to create a baseline for corals, fish, and invertebrates. 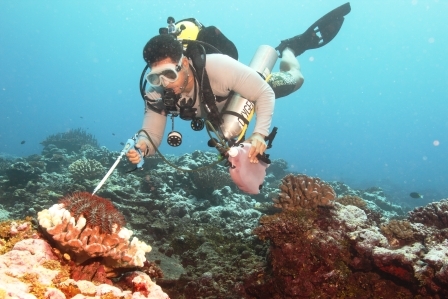 In November 2013, the College of the Marshall Islands and the Marshall Islands Marine Resources Authority teamed up with the Pacific Marine Resources Institute to conduct a survey on Namdrik Atoll. A video was produced by Dr. Dean Jacobson that shows some of the areas surveyed. So, what does 100% coral cover look like? Watch the video and see for yourself. This beautiful atoll has many areas that have 100% coral cover. To learn more about the Republic of the Marshall Islands, their coral reefs, and projects going on to help protect them, visit the AIC’s website and check out the Marshall Islands page.